Protection of synchronous generators driven by any type of prime mover: steam turbines, water turbines, gas turbines, diesel engines, gas engines. 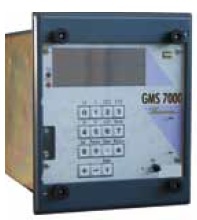 GMS7001: Used when 3 phase voltages are available (3VT/ distributed neutral) and when the zero sequence voltage, calculated internally, is used as a characteristic value in the operation of the relay. GMSH7001: Used when 2 phase to phase voltages are available and when zero sequence current is used as a characteristic value in the operation of the relay. GMSV7001: Used when 2 phase to phase voltages are available and when zero sequence voltage, from a star point or open-delta VT, is used as a characteristic value in the operation of the relay.